The Ucayali River (Spanish: Río Ucayali, IPA: [ˈri.o ukaˈʝali]) arises about 110 km (68 mi) north of Lake Titicaca, in the Arequipa region of Peru. The Amazon River takes its name close to Nauta city (100 km upstream/south of Iquitos), at the confluence of the Marañón and Ucayali rivers. 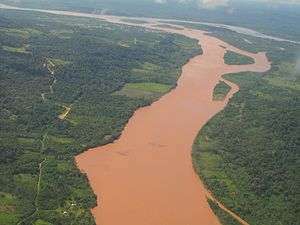 The Ucayali becomes a major tributary of the Amazon River. Navigation was blocked by lengthy sections of rapids. The city of Pucallpa is located on the banks of the Ucayali. The Ucayali was first called San Miguel, then Ucayali, Ucayare, Poro, Apu-Poro, Cocama and Rio de Cuzco. Peru has fitted out many costly and ably-conducted expeditions to explore it. One of them (1867) claimed to have reached within 380 km (240 mi) of Lima, and the little steamer "Napo" forced its way up the violent currents for 124 km (77 mi) above the junction with the Pachitea River as far as the Tambo River, 1,240 km (770 mi) from the confluence of the Ucayali with the Amazon. The "Napo" then succeeded in ascending the Urubamba branch of the Ucayali 56 km (35 mi) above its union with the Tambo, to a point 320 km (200 mi) north of Cuzco.